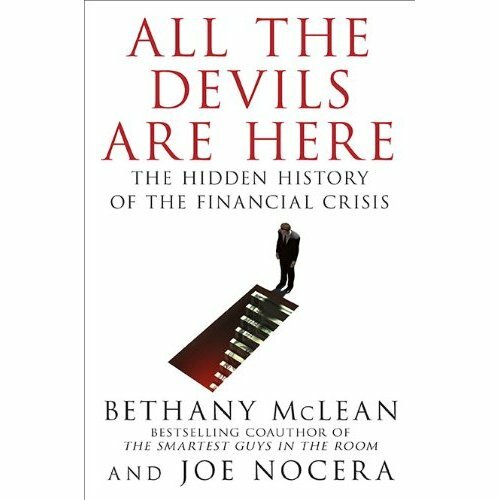 This is not the sexiest book on the financial meltdown, but it probably is the most detailed, sober analysis of the lead-up to the crisis to come out so far. For a play-by-play of CEOs running around on Lehman weekend and dodging each other’s calls (and not a single insight into why it all happened), go to Sorkin’s Too Big to Fail. For indigestible (and largely irrelevant) inside baseball about Bear Stearns, see William Cohan’s House of Cards. For some of the outlandish characters in Hedge Fund Land who saw it all coming and made a killing, go to Michael Lewis’s The Big Short (still the best read on the crisis). For a detailed and informed road map to how we got here, read this book. McLean and Nocera carefully reverse engineer the current mess we are in and show us how the gigantic landfill of toxic assets was excavated over the course of three decades and progressively filled with some of the worst investments in the history of the modern world. Each chapter provides a new domino. The first is mortgage securitization, the second is the appearance of non-bank mortgage originators and the subprime mortgage industry, the third is J.P. Morgan’s invention of the collateralized debt obligation, the fourth was the anti-regulatory bias of the Greenspan Fed, the fourth is the Clinton administration’s quashing of the CFTC’s attempt to regulate derivatives, and so on and so on. Each step on the road to the Hell of the New Normal is chronicled with an objectivity that only toward the very end veers off toward condemnation (and there is plenty to go around). Some of the material is familiar, some of it isn’t. Although based on the mountain of work by many other journalists, it manages to unearth a lot of new information. Mostly, however, it provides a cathartic synthesis of the entire mess. If you sat through the financial crisis from 2007 to the present like the protagonist in A Clockwork Orange —tied to a chair and forced to open your eyelids to see all of it— then this is the book for you. Some of it will be familiar from early coverage of the initial glimmers of rampant excess in the subprime mortgage industry. Other facts are less familiar. I did not know, for example, that the bulk of subprime lending was actually refinancing. What that means is that many people on boring and safe thirty-year mortgages were enticed (or even scammed) into shifting to the toxic ARMs and other WMDs spewing out of the financial meth labs. Now that is scandalous. Perhaps the one thing that surprised me most was the authors’ impassioned plea that financial innovation actually does not serve any useful purpose. This runs counter to Robert Shiller’s The Subprime Solution. It is not up to the layman to decide, but I must say there are powerful arguments in here for curtailing the more audacious creations of the Wall Street Edisons. Not the last word on the subject and maybe not definitive, but a great addition to the 2008 disaster genre. Talking and reading about it helps.